This is a shrine from a local temple- the first shrine for a group on the site! 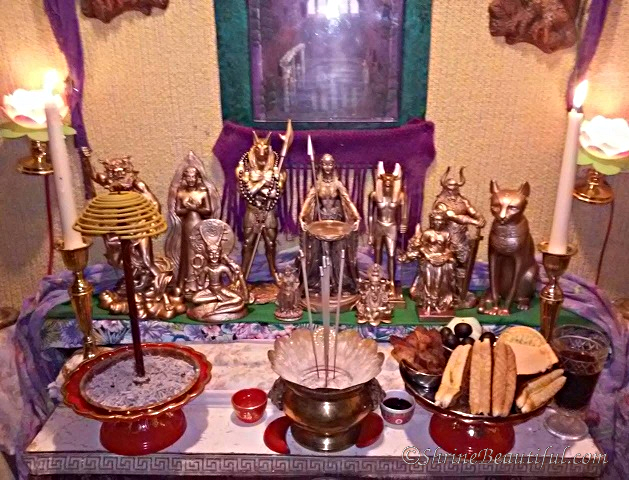 Our small temple and its tradition started years ago as a group friends just out of high school meeting in a small one room apartment in Waldron Arkansas to worship in the more open free flowing style, Focusing mostly on the worship of the healing Goddesses Brigaintia, Sulis Minerva, and a mix of Celtic, Norse and Egyptian Deities. We found out that there was at that time only one Celto-Roman temple that focused on the tradition using Wicca as a base to frame it out, ( The temple of Brigantia) sadly that temple folded under not long after we found their materials. We had also been members of other Celtic/Druidic groups and had become dissatisfied at both drama and that most groups focused on recreating how the ancient religions were in the past , without any advancement to the religions and noticed things normally got into power plays and got to the point of electing sacred “kings” , and High Priests who would talked to the Deities on behalf of the other members. We also struggled with what to do when Deities of other pantheons call to you, and the fact that most groups we looked at failed to evolve the ancient religions into the modern world. Nor was there a “temple traditions” Most groups rituals in print are based on not having a temple or dedicated place of worship, so we had to create that as well. You can find more on their facebook page. 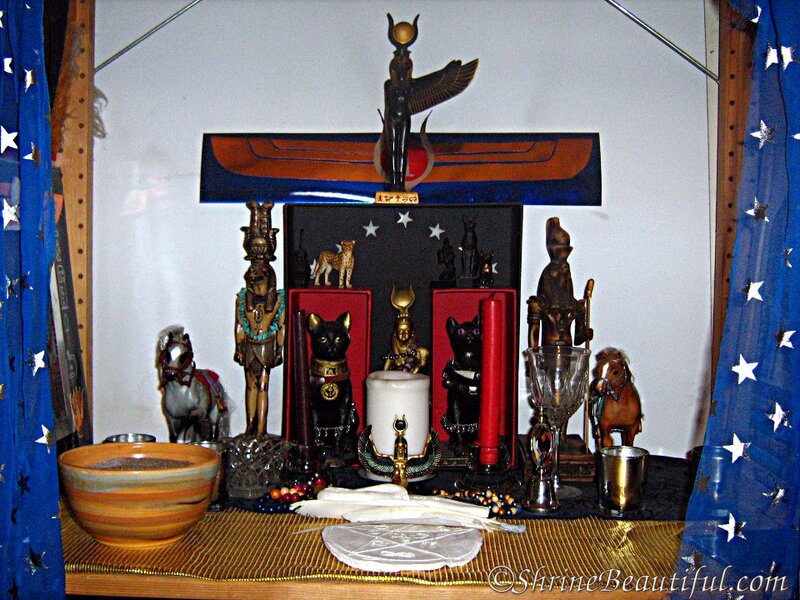 This is my shrine dedicated to Isis, Egyptian mother goddess as well as to Lady Bast, Lord Anubis and Lord Thoth. I see these deities as my celestial family that give love and support in my daily life. 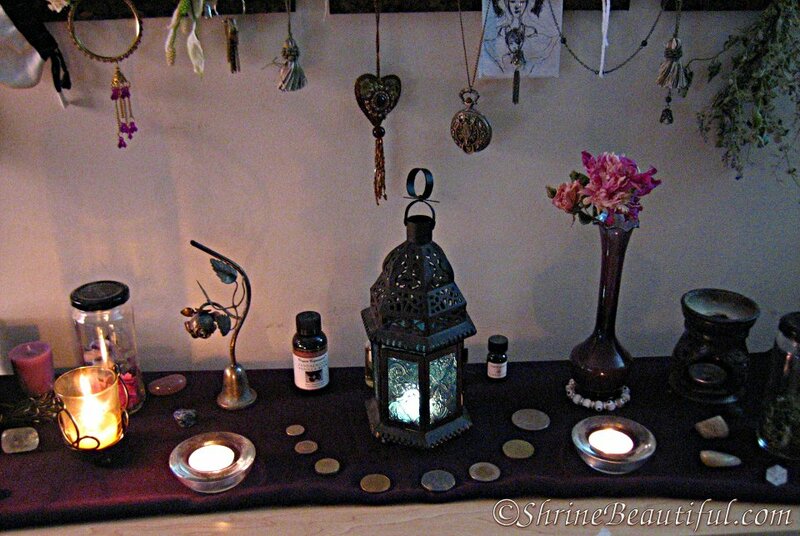 This temple is set up in my personal room and is used for daily prayer and meditation in the morning and evening. While the shrine is dedicated to Egyptian deities, I am not a follower of the Kemetic path. Instead, my inspiration came from the writings in books: “The Mysteries of Isis” by DeTraci Regula, “Magic of Isis” by Alana Fairchild and Jimmy Manton plus many others. I have also borrowed many ideas from other teachers including Buddhists like Thich Nhat Hanh whose idea of “No Mud, No Lotus” has guided me through struggles I have had this past year. He likens suffering to the mud in which a beautiful lotus flower of happiness can grow in our lives. Without this sorrow and suffering we could not reach our beautiful potential. My Yellow Lotus Temple shrine is set up with these and many other ideas in mind. First it needed to be a beautiful and peaceful place where healing could take place. It also served as a spiritual home that could be accessed anytime of the day or night and where I could be myself without expectations of others weighing in. From the top: A yellow lotus ceramic ornament that represents the goal of growing to our full potential despite the challenges and set-backs we face in our personal lives. Below is a small metal medallion that states: “Through it all, the Lotus Flower Blooms”. On top of the shrine is a sleeping cat representing the peacefulness of the temple. The candle holder in the middle has ocean shells and represents friendship since it was a gift given to me many years ago. To the right is small chime bell with ringer for morning prayers. The picture to the left is a representation of Lord Thoth (yes he is enjoying a latte while contemplating his writings) and to the far right are temple musicians making the offering of music and sound to the Gods. 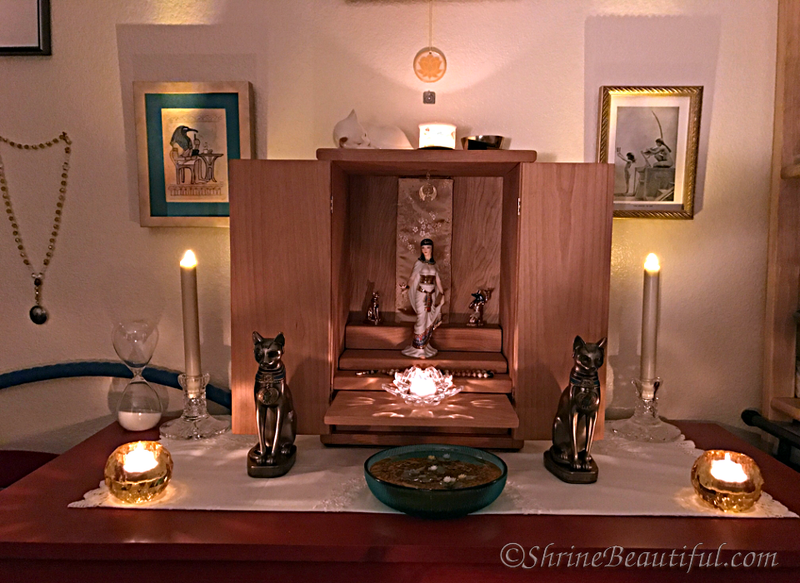 Hanging inside the shrine box is a gold medallion with a Ankh representing life and a reminder that the greater good should always be considered when making decisions in our daily lives. In front is a statue representing Queen Isis with smaller figurines representing Lady Bast and Lord Anubis to either side. 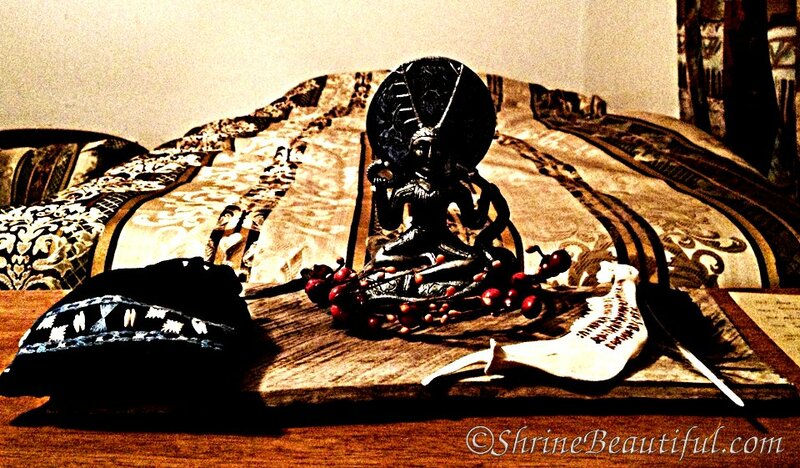 At Isis’ feet is a meditation mala for focused prayer with beads comprised of sandalwood, lotus seeds and bluestone. The lotus candle holder below her is a representation of our inner potential that the Gods help us cultivate everyday if we ask for their help. On the far left of the box is a sand timer for meditation timing without digital aids. The two taper candles on either side are Luminara battery operated candles that work wonderfully for lighting without wax drips. The two cat statues on either side are protective ornamentals that denote that this is a sacred space and is also protected by positive, powerful forces. The bowl in the middle is a miniature koi pond complete with lotus flowers which adds a water element that is peaceful. It is also meaningful to remind us that to reach our full potential we must rise out of the mud of our lives and seek spiritual light. 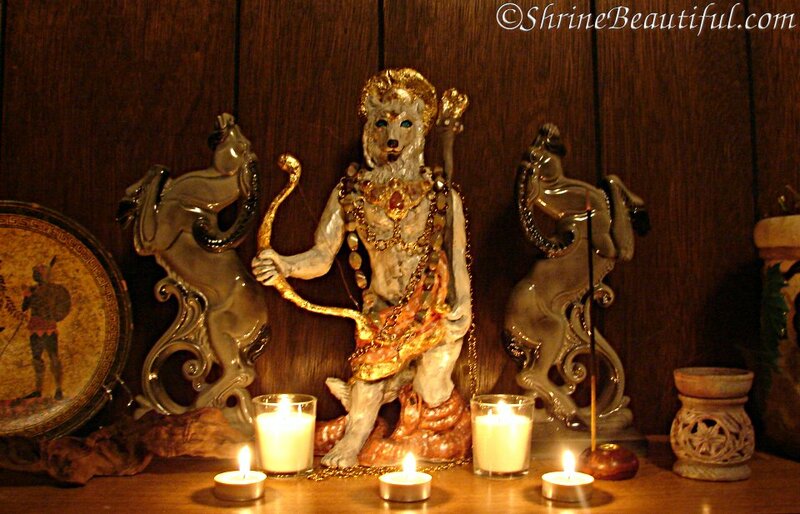 The two candles on either side are gold colored glass representing the inner spiritual light we can share with the outside world as the Gods have shared theirs with us. It is my sincere hope that you may find peace and enlightenment on your chosen spiritual path and that my shrine has encouraged you to tap your inner creativity and personal truth. How do you use this sacred space? This is my shrine of Apollon Lykeios that I pray at in my private room upon rising and before bed. 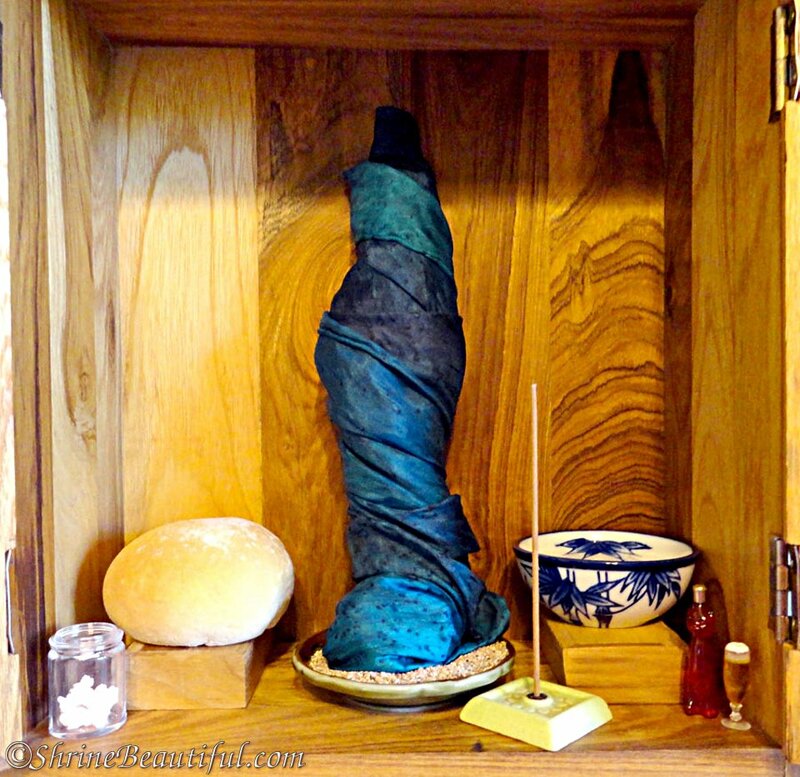 Long before I came to Kemeticism, when I still identified as a Wiccan, my SO concocted a rite to do for Osiris, which he taught to me. I can’t really say where he got the idea from- neither of us really knew much about Kemeticism or its holidays. But the rite seemed to fit, and the more I’ve learned over the years, the more I see the correlation between it and the Mysteries of Osiris. I had written about my rites briefly last year, but this year I’d like to do a full ‘tutorial’ on the rites I perform every year. This is based entirely off of UPG, but I think that this UPG is rather applicable to this holiday. The rite I’ve written out below isn’t exactly the original format- the ritual has grown and changed a little bit over the years that I’ve done it. It’s a growing practice and feel free to modify it to fit your needs as well.